MEMOFIN - Risk Mitigation Standards for Non-centrally Cleared OTC Derivatives - L'information financière que vous ne trouvez nulle part ailleurs ! This final document presents the risk mitigation standards for non-centrally cleared overthe-counter (OTC) derivatives from the International Organization of Securities Commissions (IOSCO). IOSCO has developed these standards in consultation with the Basel Committee on Banking Supervision (BCBS) and the Committee on Payments and Market Infrastructures (CPMI). 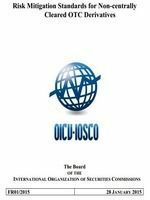 In September 2014, IOSCO released the proposed standards for consultation. The comments received from the consultation have been considered in finalising the standards.